Lydia and Ida met in 2016 in Austin Texas, as part of the House of Songs Songwriting Summit. They lived together for two weeks co-writing songs with a group of musicians from Canada, the US, and Europe. A Danish born musician, Ida comes from a tiny village of 300, called Traeden. This year she founded the Traeden Winter Festival, held in the village's 800 year old church. Lydia was invited to travel to Denmark to play at the festival, and was honoured to be the only non-Danish performer in attendance. Join us for some traditional Danish 'hygge' at The Rogue Folk Club, Ida's first concert (and visit!) to Canada. These two woman's songs will bewitch you with their beauty. And their friendship formed through music will shine clear through their joined performances. Lydia Hol's music leaves you with the taste of salt on your lips, and the feeling of the wind in your hair. Since the release of her debut EP, Boats, in 2012, Lydia Hol has toured the country from coast to coast, filling rooms with her songs and stories. 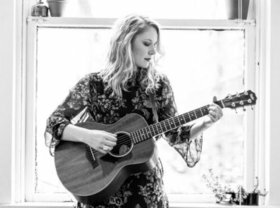 Lydia’s time spent living in Ireland flavors her performances with a storyteller’s honesty and charm, and her studies in English Literature has helped to shape her songwriting into an insightful, and mature art. Sharing the stage with folk legends such as Sylvia Tyson, Dar Williams, and Shari Ulrich as she did this past year, has further encouraged Hol’s place as one of Canada’s most dynamic young artists. In 2013 Lydia was a Top 20 Finalist in the Peak Performance Project, and a Regional Finalist in CBC’s Searchlight Contest. In 2014 she showcased in Toronto and Kansas City, was the Featured Musician at The Vancouver Mayor’s Arts Awards, and curated the Acoustic Guitar Project. The writing and recording of ‘Heading North’ was the focus of 2015, recorded at Afterlife Studios in Vancouver. But whereas ‘Boats’ was very much a solitary, stationary effort – that of a young artist writing in her quaint cabin on the Pacific coast – Heading North is a more communal collection. The arrangements on this record are more lush and elaborate than those on its predecessor, thanks in large part to a top-tier cast of supporting players. The list is a long one, featuring the likes of Jesse Zubot (violin), Paul Rigby (guitar, steel), and John Raham (drums/engineering) Many of the musicians are on loan from Be Good Tanyas frontwoman Frazey Ford, and helped bring that welcome collective spirit to the album. At their core these are Hol’s songs, and embody her essence as a musician and lyricist. On both fronts, the album captures the essence of femininity through a delicate, elegant take on folk – simultaneously subtle and sultry; sometimes vulnerable, other times tenacious. Her voice and guitar anchor a host of tasteful instrumentation that evokes a range of tones from country to classical and beyond.